That’s 14 or so a day?!! Is this a new kind of torture?! Or just an excuse to spend the week drawing everyone I see?! You say Why? For the fun of it! To improve my eye! Change of pace! To get me out and drawing in the community. Now to get them done. Luckily I am on spring break this week. Hurrah! This sketch out is being lead by Marc Tao Holmes and Liz Steel. 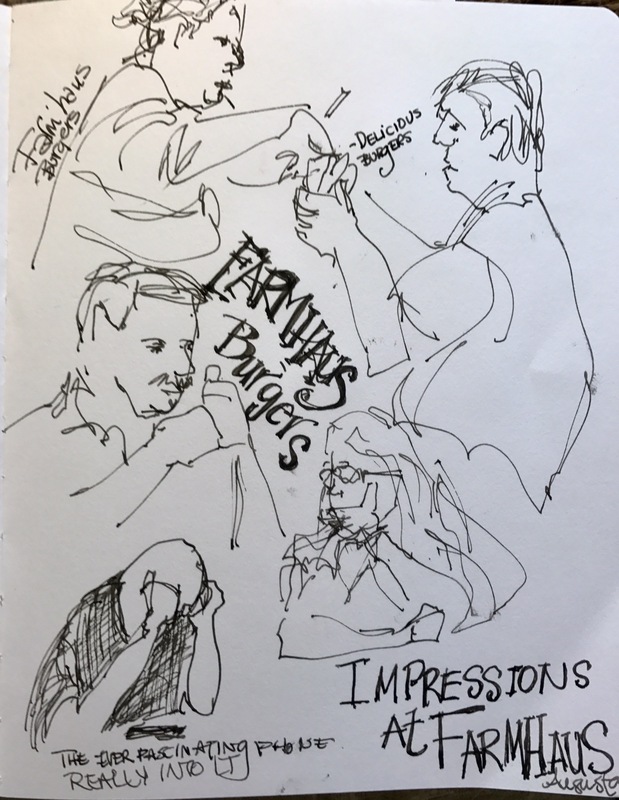 I drew these people at Farmhaus Burgers in downtown ugusta. It was slammed with people. And the burger was pretty delicious too. As were the French fries not that I could eat all that food. The guy on the bottom left was completely absorbed in his iPhone. I wish I had had longer to draw him but I was on the run. He kept putting his heads on top and all over his face. I wonder what he was reading?! 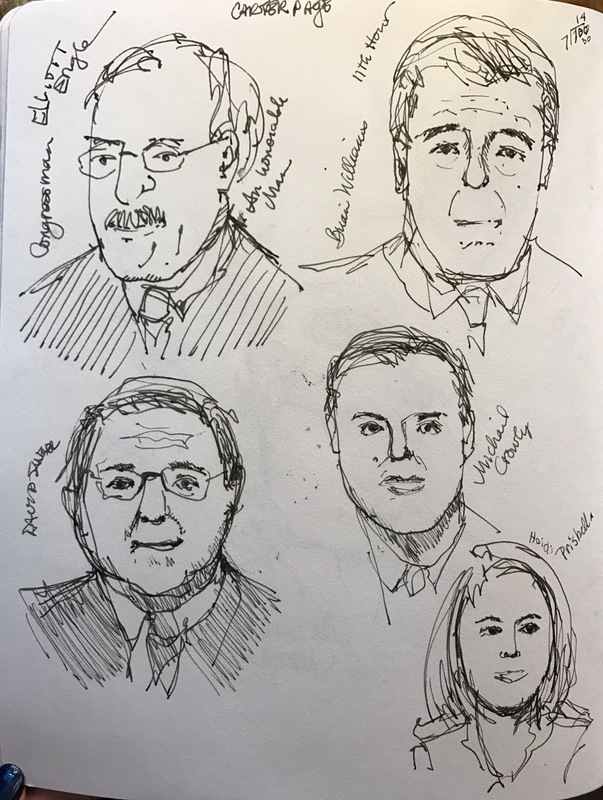 A few drawn of the dvr the Last Word with Lawrence O’Donnell. He was interviewing Michael Moore always an interesting man. Great thing about the dvr is that you can pause it if you need too. Since these are suppose to look human but not represent people I didn’t. More talking heads on Brian Williams show. Top Left – Congressman Elliott Engle who refused to shake 45s hand. First president he has done that with. 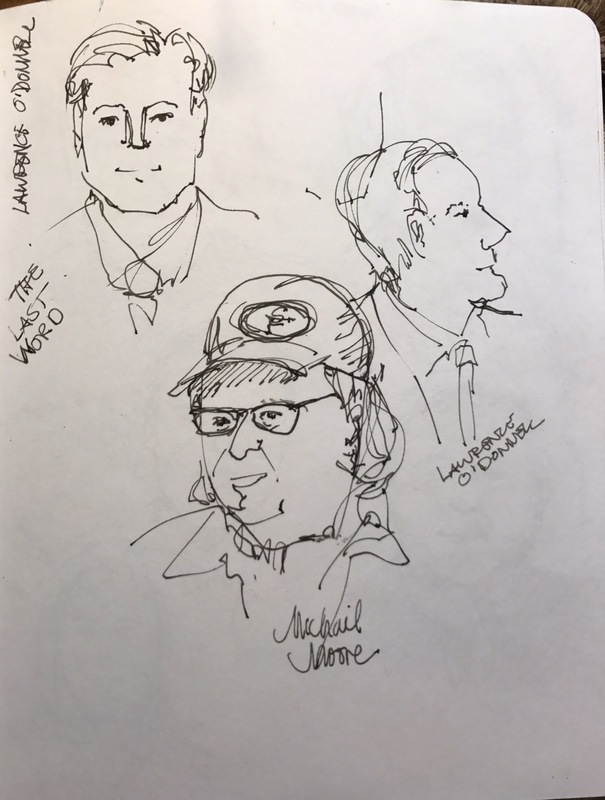 These were drawn in just a few minutes with my Lamy safari in a Stillman and Birn Alpha. Ttyl off to draw. Stay tuned.